the project team only looked at the DDA budget but their recommendations would greatly affect other DSHS budgets due to the fact that a great majority of people in DDA also utilize and receive services from several of the other DSHS programs. the project team failed to realize that the Intermediate Care Facility (ICF) or Residential Habilitation Center (RHC) is a medical facility – their recommendations to close and/or consolidate did not even address the issue of all the medical/nursing/psychiatric/therapy/pharmacy/nutrition and more that these residents receive under the DDA budget at these medical facilities. Not one member of the DD Audit Project Team has medical or healthcare clinical or research experience yet they made healthcare decisions about some people with extremely complex medical and healthcare issues. No legislation based on the DD Audit should be used given the multitude of errors. Doing so would create more chaos and crisis. 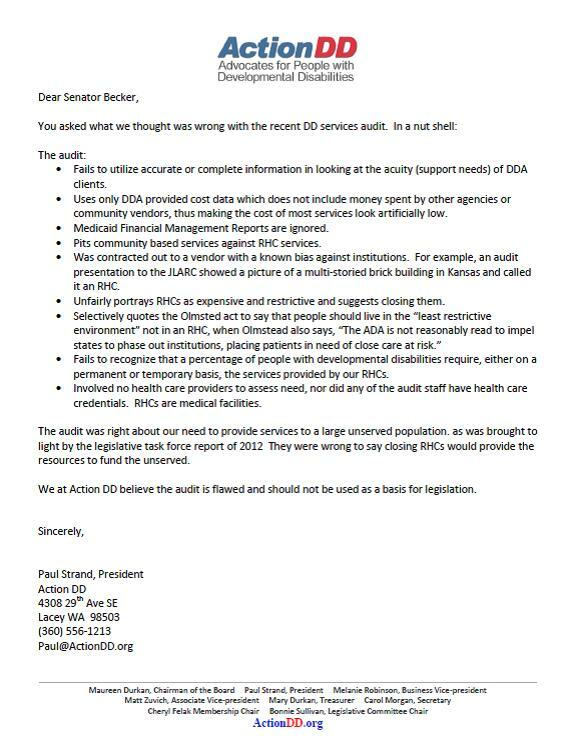 Response from the Human Services Research Institute in answer to my questions about our State Auditor DD Performance Audit which incorrectly referenced the NCI data for their audit. Because of this, the data could not be included in the national averages for the year 2009-10. WA was issued a separate state report on these data (see attached.). Your question brought to my attention that this information should be noted in the chart generator for WA for that year. I will work on getting that info added. The attached file contains our data from the NCI Consumer Interviews. There were 545 adults who participated in a Consumer Interview. The interview responses and feedback forms are store in separate Access databases. We have a two year data collection cycle, so this data was gathered between Jan 2007 -Dec 2008. It was all gathered using the old version of the interview form. We modified the data entry forms a bit to cover our additional questions and to make the data entry easier for our quality assurance staff, but the numbering of the NCI items in the tables has been left intact. The audit report ”Developmental Disabilities in Washington: Access and Equality” is extremely misleading regarding the facts . The Auditors left out significant parts of critical assessments, utilized biased materials, did not understand how the numbers relate to the needs of the people being served, and utilized assessments which were not indicative of the needs of a large segment of the population being audited. In addition to these errors, the auditors totally missed the issues of what the service costs represent and if the Developmental Disabilities Administration does not cover the costs there was no indication of which agency does pick up these costs. These costs (healthcare, therapy, hospitalizations, transportation, food, etc.) are contained in other budgets somewhere and need to be considered in the whole picture, not simply forgotten and ignored. The issue of cost-shifting is not even addressed. When the auditors refer to the CARE assessment to indicate support needs of the population, they only refer to 3 of the 7 categories which are measured. It is curious that the auditors refer to the CARE assessment of the RHC residents without reference to when this test was done. The number of clients they count is different than the number referenced in the RDA 5.36 report of 2011, (Lucenko & He, 2011) which documented the only time that the CARE assessment has been performed on RHC clients. It is shameful that this audit is clearly biased and was unable to objectively gather and analyze the data. These errors and omissions are extremely critical to the understanding of the services for and needs of our population with I/DD. Overlooking them does a huge injustice to the citizens of our state. Lucenko, B. A., & He, L. (2011). Assessment Findings for Persons with Developmental Disabilities Served in Residential Habilitation Centers and Community Settings. Department of Social and Health Services. Research and Data Analysis Division . Thank you for responding to our performance audit “Developmental Disabilities in Washington: Increasing Access and Equality.” I would like to address some of your concerns. You noted the total costs of care in a community setting are not reflected in our comparison of costs between community care and residential habilitation centers (RHCs). This is not an uncommon point of discussion where RHCs are concerned, because many of the costs those facilities incur, such as grounds maintenance, are not borne by government — or they are covered by other state and federal programs — in other settings, such as family homes. Our performance audit was an evaluation of Washington’s developmental disabilities programs, and so focused on direct costs to the Developmental Disabilities Administration. You expressed concern that we cited researchers who are “biased against congregate care.” Our approach was based on national best practices, which favor integrated care over congregate care. Similarly, we aligned with the U.S. Department of Justice in our interpretation of the U.S. Supreme Court’s Olmstead decision, which affirmed states’ obligation to provide care in the most integrated setting appropriate for a client. Finally, you had reservations about some of our data sources, specifically our use of certain CARE assessment categories to indicate a clients’ level of support needs, and our decision not to use Certified Costs Reports from contracted care providers as a data source. Our goal was to provide a reliable and complete evaluation of state programs and their costs. We used the most recent CARE assessments available for the entire RHC population, from 2010, and consciously selected the three categories within the assessments most closely associated with costs of care: medical, behavioral and activities of daily living. For cost analysis, we chose to pull actual expenditure data from the administration’s financial system, allowing us to capture all payments for the period we reviewed. We are confident that this source provided us with reliable and accurate data. Again, thank you for your interest in our report. We share your concern for the wellbeing of developmentally disabled Washingtonians and appreciate your feedback and observations. Thank you for your reply to my concerns regarding the validity and skewed interpretation of data used in the recent audit of the Developmental Disabilities Administration. It is extremely unfortunate that our own Department of Justice misinterprets the US Supreme Court Decision Olmstead and has instigated expensive and undesired litigation against our most vulnerable populations based on their misinterpretation. Nowhere in Olmstead does it indicate closure of institutions as a goal. Olmstead honors individual choice and realizes that for many people the institution may be the least restrictive and most appropriate environment for them. The Department of Justice is taking away this choice. There are many other issues in the audit which are misrepresented and inaccurate. In the RFP for this audit it states “DSHS is currently transitioning its regional structure from six to three regions across the state. This new geographic configuration is designed to offset expenses, breakdown silos, and help administrations within DSHS work more closely together.” In stating that the audit was to only look at the Developmental Disabilities Administration is one thing but then to take that narrow view and expand that to making recommendations which would greatly affect other budgets in our state is irresponsible and negligent. This perpetuates the silos by only looking at one budget. This does not take into effect the other services that many people with DD utilize nor does it address the issues of cost-shifting to other agencies such as police, fire, hospital and emergency room visits, stress on families, loss of jobs and income for families due to lack of alternative caregiving and many other issues that are not addressed when only looking at the DDA system. The cost data used in the audit was very inaccurate and misleading. One example is the fact that the RHC cost is not an individual cost and therefore one does not get a range and a standard deviation or cost differences for care of different support needs. These figures were apparently made up or guesses. The issue of federal and state funds was not addressed in the cost of care. In addition to the cost data, the data on the resident acuities and choice was reported incorrectly and skewed. It is clear in reading through this audit that the authors do not know how to relate the numbers to real people and how their opinions will affect real people. From the very start of the report and from the first slide in the presentation it is clear that the authors had not visited an RHC. The photo of an old, large brick building representing the RHC is not reality, nor is the photo of the community home. I look forward to the day when these issues can be discussed openly and the facts are transparent. Until that day arrives reports such as this do much more harm than good.